Karen welcomes the opportunity to talk about the writing process and to share her passion for researching and writing historical fiction and nonfiction and animal stories. She is available for author visits and readings for grades 2 and up. SABOTAGE Student Activity Guide is available. In Wild Horse Canyon, a ponderosa pine seed sprouts and begins to grow. Seasons pass and the tree's growth becomes a measure of human history, from First Nations’ quests and trapping wild horses, to fur brigades, railway construction, secret wartime commando training, and more. 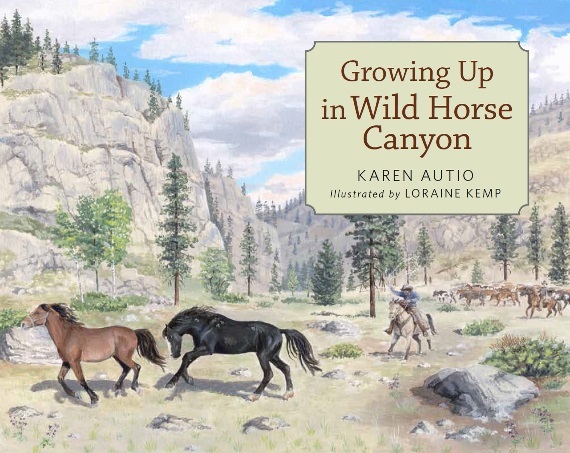 In this engaging and informative presentation, Karen Autio shares the inspiration behind her picture book Growing Up in Wild Horse Canyon. She draws from her collaborative journey with illustrator Loraine Kemp exploring the canyon and other historical sites and consulting Indigenous and non-Indigenous experts. 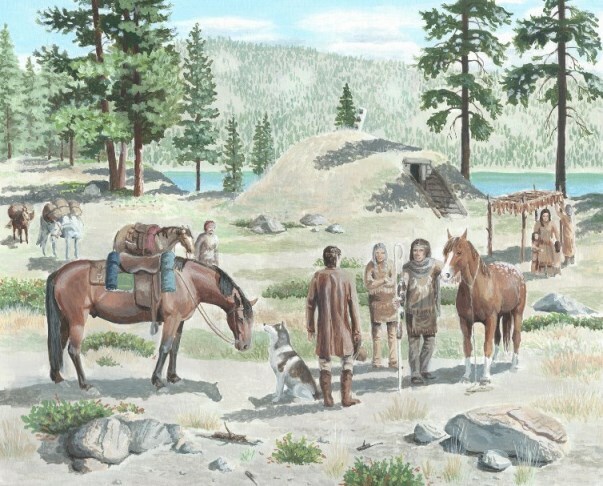 Based on their discoveries of how First Nations history is interwoven with European settlement, Karen shows how they authentically portrayed this fascinating research through narrative nonfiction, maps, and illustrations. Making effective use of props and images, Karen reveals how the writing, illustrating, and publishing process works from story draft to art manuscript, illustrations, and final proofs. This presentation includes a brief illustrated reading from Growing Up in Wild Horse Canyon and time for students to ask questions. The length of presentation and depth of information shared are determined by the age range of children in attendance. To promote interaction, Karen prefers to meet with smaller groups (maximum four classes) with no more than a three-grade spread (i.e. Grades 3–5 or 4–6). In this fun, interactive presentation, Karen Autio weaves together her passion for science, language arts, history, and sea otters. She also gives students insight into the challenges of writing and encourages them to follow their interests to write their own stories. Karen makes effective use of props, a hands-on activity, and PowerPoint images to enhance the learning opportunities for children. Both Karen’s chapter book Kah-Lan the Adventurous Sea Otter and her presentation are fuelled by fascinating research about the unique characteristics that help sea otters survive spending their whole lives in the cold Pacific Ocean. With her enthusiasm and knowledge, Karen reveals these characteristics and the history of sea otters, from near extinction to their recent and amazing comeback, despite continuing threats. She also explains how sea otters fight climate change by eating the sea urchins that destroy the kelp, a plant that absorbs carbon dioxide. In enabling kelp to flourish, sea otters help slow down the warming of the ocean and increase fish habitat. Karen shares her journey as an author, starting with her childhood writing. She then notes the steps and persistence required to get Kah-Lan’s story in print (first draft to published book in 30 years must be some kind of record! ), and presents sample drafts of the story and final manuscript, together with sketches and final art by illustrator Sheena Lott. She also shows students how the large folded printed pages and flat cover fit together to form a printed book. In writing Kah-Lan, Karen played with language to express Kah-Lan’s point of view and immerse the reader in his watery world. After students learn Kah-Lan’s home is a sea-tree (kelp) forest, old sea otters are Grand otters, and when he encounters people in the story, they are furless ones. Karen then leads students in creative wordplay to express their own new words from different animals’ perspectives. This dynamic presentation includes a brief reading from Kah-Lan the Adventurous Sea Otter and time for students to ask questions. Length of presentation: Presentation length (30-60 minutes) and depth of information shared are determined by the age range of students in attendance. To promote interaction, Karen prefers to meet with smaller groups (maximum 90 students) of similar grade level: 2–3, 3–4, or 4–5. In this lively, visually appealing presentation, Karen Autio engages students in Canadian history and the immigrant experience, as she does in her trilogy of historical novels. She shares her journey as an author, including writing projects in her childhood. Karen makes effective use of props, PowerPoint images, and hands-on materials while sharing her passion for researching history and the resulting “jigsaw puzzle” of transforming historical facts into a fascinating story. Karen’s goal is to inspire students to read, research, explore history (both family and general), and write using their own interests and experiences, showing how revision tightens and completes the exercise. She conveys writing is not a one-step process, that persistence is needed to get the story right and get it published. 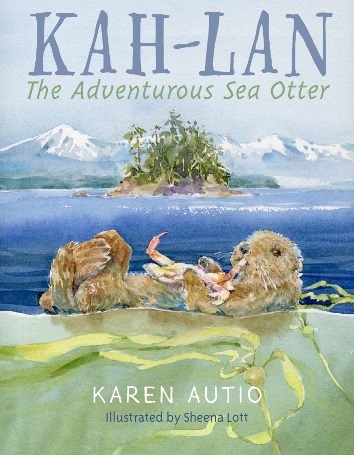 In fact, her newest book, Kah-Lan the Adventurous Sea Otter, took 30 years from first draft to publication! Karen shares the editing process of Sabotage, from getting feedback from student editors, to being directed by her editor to rewrite the entire manuscript (cue gasps from the audience) and the benefits from that revision. Karen’s historical novels focus on immigration and adapting to a new life in Canada. Other intriguing historical events in the stories include the 1914 shipwreck of the Empress of Ireland (Canada’s Titanic), survival during a tuberculosis epidemic, and espionage, sabotage, and internment of enemy aliens during the First World War. Presenting these topics to students captures their attention. In teaching children about Canadian history and identity, Karen’s books and presentation support learning outcomes for both Language Arts and Social Studies. For each novel, a Teacher’s Guide containing activities and questions for research and discussion is available to download at the top of this page. Karen reads a captivating scene from one of her novels, then compares researching to time travel and involves students in exploring the resources accessible to a writer of historical fiction. Karen explains the publishing process from first draft to page signatures and flat cover that go together to form a printed book. With the help of volunteers, Karen demonstrates the stages of cover design for one of her novels. Karen's interactive school presentation is designed for up to three classes, with a maximum of 90 students. Please email Karen directly to arrange for a school presentation. Presentation: "I am so impressed with your ability to engage the students by bringing them into the creation of your book and artwork. I really appreciate how you strove to incorporate a First Peoples’ perspective. The visuals of the canyon, the water, the map, and the trail worked well because these kept the children engaged. They really enjoyed the personalized stories." Writing Workshop: "I really liked how you showed/talked about getting your information for your writing and the importance of having authentic information. I also liked the visualization activity and the instructions to use strong verbs and punctuation, reinforcing what we are leaning in Language Arts. The students were very engaged during the presentation and the workshop. THANK YOU!" Presentation: "Great connection to process of book and story creation—important to see photos of exploration. Audience participation worked well as it is so important, especially for young students. Nice visuals from book, to exploration, to illustration. Very authentic inclusion of Indigenous perspective. Thank you." Writing Workshop: "A captivating visual piece of writing to have students imagine. Several visuals to have students engaged. Very interesting historical information provided. Instructions were clear, with excellent story starters and an appropriate length of time to complete the tasks." Presentation: "Great job! You thought of every way to reach all the learners! Worked well having large visuals to engage students, photos to support the background story, and sharing point-of-view examples (European vs. First Nations) and importance of [Indigenous] advising editor. You both really brought the process of writing and illustrating a book to life! Thank you." Writing Workshop: "Writing task very manageable and interesting for students … liked that you explained vocabulary." "So pleased to hear that Sabotage will be used with the grade five curriculum. It is a wonderful historical novel. Grade Five was my favourite grade to teach and I would have loved teaching your book. You are a true Canadian Gem. Keep up your superb writing. A fan,"
"Children`s author, Karen Autio, came to four branches of the Ottawa Public Library in 2014 to talk to visiting classes about her books. We received excellent feedback on her presentations here and … we would be happy to host her again! Karen was a delight to work with. Her communication while we organized the visits was clear and helpful and her enthusiasm was apparent. She did a great job with engaging the children and keeping their attention throughout her program. Students were so enthusiastic about her visits that she ran out of time to answer all of their questions." "I highly recommend Karen Autio … She interacts with students in a highly engaging manner and sparks the love of writing and reading in them! Her books were flying off the shelves after her session with us!" "The Thunder Bay Public Library has hosted Ms. Autio on three occasions and each event was a unique experience … Her presentations were liked by both an open audience and school classes which we invited to the Library … In our audience were several families representing different ages and each was very excited to read her book after the presentation – child, adult and senior – and that is evidence of a story well-told." "We really enjoyed your presentations! The students were very inspired and intrigued. Staff were amazed that they had very little knowledge of this event in history! Listening to an author read their own book in person is so powerful. Students were able to hear the language as you intended it to be read. I noticed when you stopped reading a passage from Second Watch students said “oh” and they wanted you to keep reading. The books have been very popular with the students in the grade 4 and 5 classes that attended the presentation. Your book linked so well with grade 5 curriculum about immigration and Canadian history." "It was such a pleasure to meet you and listen to your experiences. The students loved your visit. Our library copies of your books are all on hold lists, and the other copies are sold. You really have inspired us all, and especially our young writers. Thanks again for everything!!" Ruth Rocklin, Teacher/librarian, Pacific Christian School, Victoria, B.C. "You inspired me by the way you brought your first draft. I learned that you can't write a good book like Second Watch without doing research." “I was extremely impressed with all aspects of Karen’s visit. She was organized and I appreciated her e-mails with reminders about what she would need, and details like time and location of her presentation. 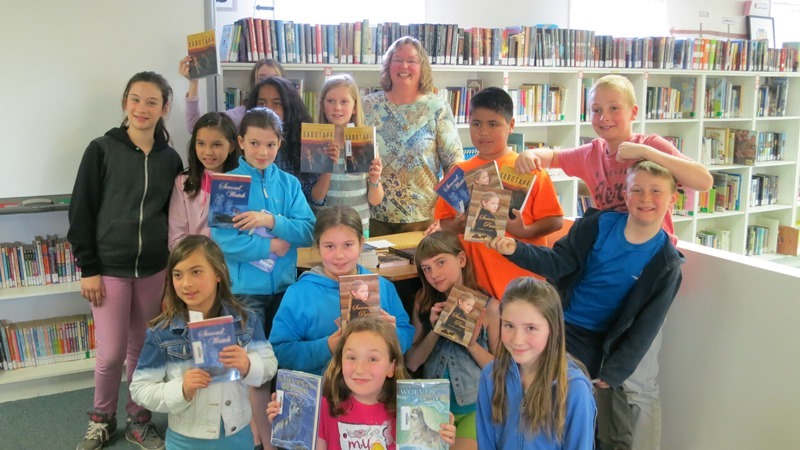 All of my grade five students had read Karen’s book “Second Watch” (2005) and were enraptured by it to say the least. The grade five teachers at my school were very impressed by the quality of writing in Karen’s story. “Second Watch” is an extremely powerful book with many curricular “ins”, including the theme of immigration. Ms. Autio’s second book, “Saara’s Passage,” is being highly anticipated at Rutland Elementary as the students anxiously await the fall publishing. "I love the history and how much detail you put into your book. It'll help me for when I write my own book and add the detail, history, and fiction like you had in your book!" "I learned that it's good to ask others about your writing when you're writing a book or story." “I recently had the pleasure of hosting Mrs. Karen Autio at our school to speak to our Grade 5 students. Mrs. Autio spoke to the children about her book, Second Watch , which focuses on immigration in Canada and the sinking of the Canadian Pacific ship, the Empress of Ireland. Mrs. Autio also shared her journey as a writer and the process she follows as she creates a story. Her presentation kept the students enthralled and prompted many interesting and thoughtful questions. The children and teachers were equally fascinated with her story and with her presentation. Mrs. Autio interacted well with the students, was well-prepared and conveys her passion for the topic. "Thank you for coming!! I loved it when you got us going with reading some of the story!! THANK YOU!!" On April 2, the intermediate students and staff of Ellison Elementary attended an hour long presentation by local author, Karen Autio. Ms. Autio wrote Second Watch, an historical fiction novel about the tragic 1914 sinking of the Empress of Ireland. During the presentation she spoke about what it takes to become a published author, how Second Watch came to be, researching historical settings and events and the process of book cover design. Students were captivated by the selection she chose to read from her novel and were left with the strong desire not only to get their hands on a copy of Second Watch, but also to do their own research about this largely forgotten event." "I liked that she actually gave up her own time to come and see us. She did an awesome job. I hope she comes again."